More fun in the SIB, new experiences and learning curves! Last weekend saw some slight offshore winds and things looked feasible to get out on the SIB. We certainly haven’t seen many days recently where this would be possible but along our part of the coast there is nearly always somewhere you can find the wind off your back and this can certainly give an opportunity to get slightly offshore. The main reason behind getting the SIB was to improve our chances of fishing during the daytime or when the conditions didn’t really take our fancy from the shore and it’s also a huge new learning curve for me and getting any sort of result from these sessions is always pleasing. Sunday saw me and Mark fishing from his SIB over new ground to both of us, the water was slightly choppy as we launched but as the day went on the sea flattened off and left us with a mirror finish. Unfortunately we didn’t manage to find many fish. We fished around some offshore features that looked perfect but we only picked up a few solitary Pollock and Wrasse and not the Bass we where hoping for. Either way it ended up a beautiful day to be out and as the water calmed watching the current flowing around rocks and over structure certainly got us in the mood as the sun set. Maybe the neap tides affected this? or maybe it’s just not the right time of year? We will certainly be back to try again and see if we can sus out some of these offshore reefs and banks. Tim surprised me the next day saying he was leaving work early. We met up at midday at another new launch site. Surprisingly the wind had swung around South West for a small part of the day and the sea didn’t look ideal but we could still launch. Knowing it was going to be blowing Northerly at the end of the day we opted to head out anyway and fish close to the shore where it wasn’t so rough to start. Hopefully this would still give us an advantage over fishing from the shore. We started just a couple hundred yards offshore and tucked just out of the wind. Tim started with a Blue 120 Fiiish minnow and I opted to try a 5” Keitech easy shiner on a Savage gear 29gm weedless jighead that are new to me and my first impressions are these are going to be a firm favourite jighead when fishing from the boat. Well it didn’t take the Fiiish minnow long to find it’s first fish. 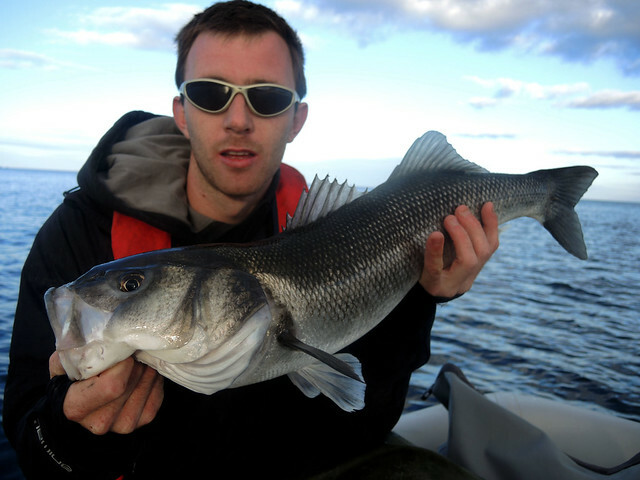 A nice bass around 55cm for Tim taken sink and draw near the bottom on his first cast! 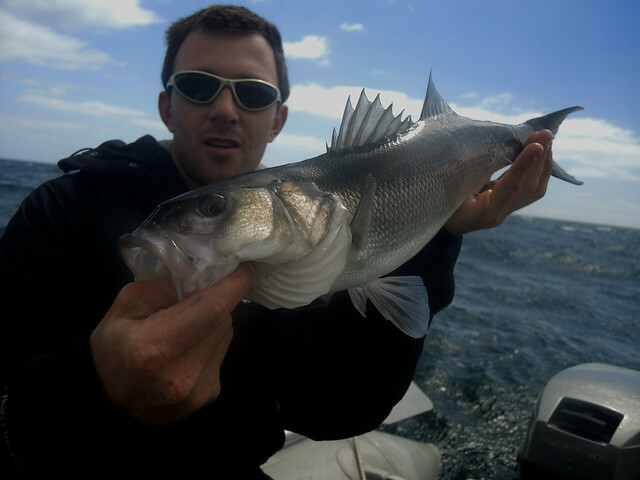 We took a few more Pollock and I managed a schoolie on a fast retrieve back to the boat on the Easy shiner. Soon the wind swung around and this enabled us to get to more over the area I wanted to fish. First though we had a quick scout over a shallow reef that extends offshore for a few hundred yards. I didn’t realise it was so shallow so far out, It looked awesome and we couldn’t help but have a few chucks with the surface lures right then. The tide was still on the ebb and I have taken fish here from the shore before so we decided to come back as the tide started to push later on. We continued onwards to some deeper reef further out. Here the wind was drifting us offshore and not with the current. It’s interesting to see how you get these pockets of fish. 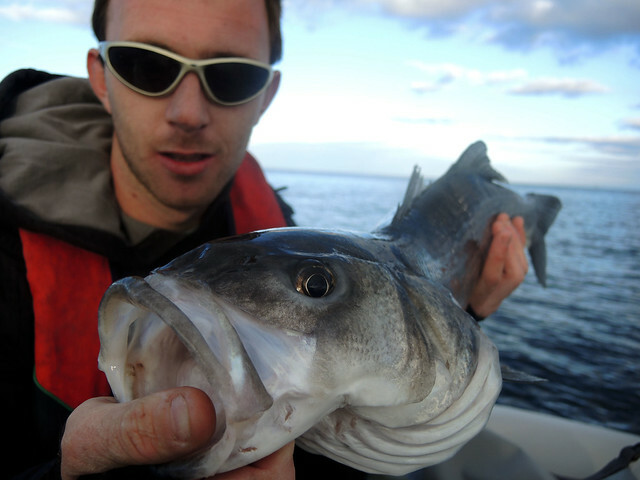 Normally if one of us got a take whether it was from a Wrasse or Pollock the other would too. Without a fish finder it’s hard for us to really see whats going on below us and find some proper features but we knew roughly what each drift was that we did. 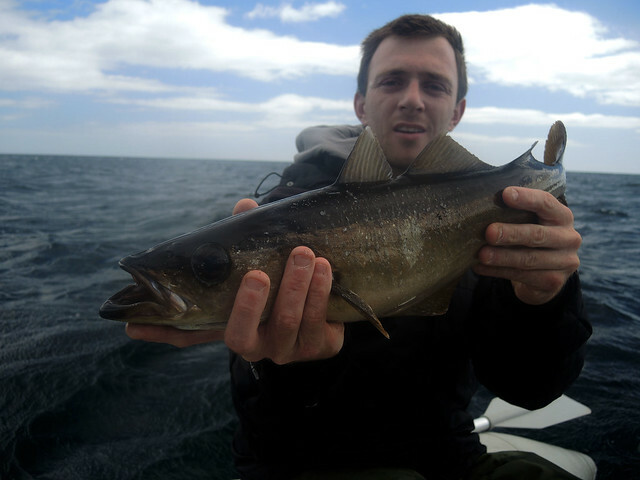 A few more schoolies later and the best Pollock of the day for me around 58cm I hooked into a really weighty fish. It just held deep with the odd thump and it nailed my 140 Fiiish minnow on the drop. 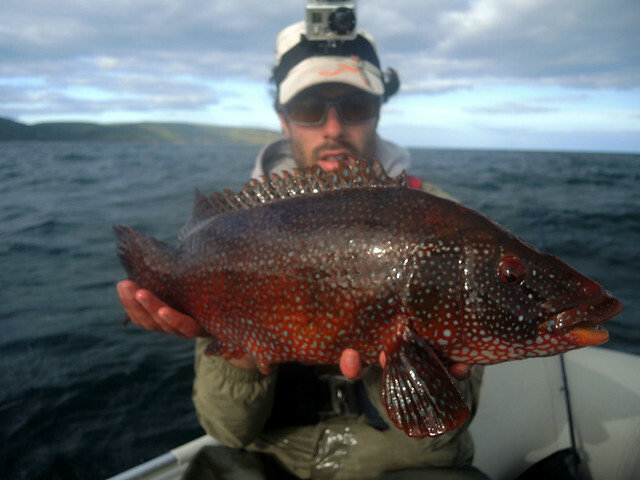 I’m not going to lie I thought it may be a good bass but instead a PB Wrasse from the boat at 52cm. A really chunky healthy fish! I’m not going to lie but the the Fiiish minnows where winning on the fish front. I had swapped after Tim kept pulling in fish and switched to a 120 body on a Savage gear 29gm weedless jighead. 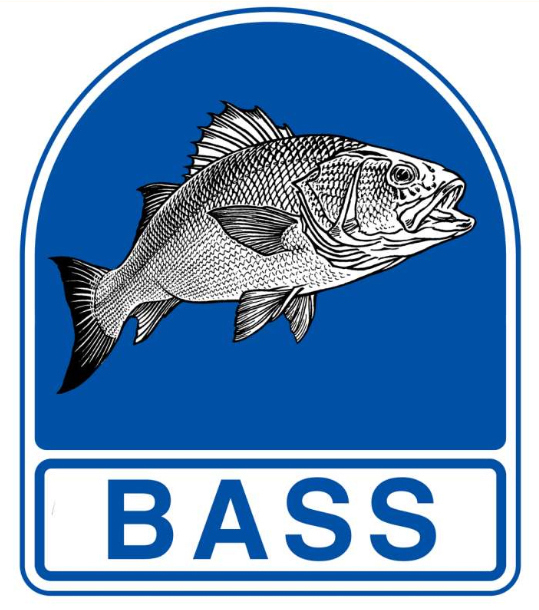 I have had quite a few bad experiences from the boat now with the Fiiish minnows. Either the body get’s destroyed very quickly or worse the jighead comes back with no body and no hook! I much prefer to fish them on a fixed jighead, sacrilege? maybe but they still catch me fish and after good amount of Pollock and Wrasse my 120 body was still fishing on the Savage gear head… We will see when I get some of the Blue and Kaki glued to these jigheads if there is any difference in there catch rates compared to the articulated jigheads. After this we attempted to drift over some interesting ground I located on the chart but this didn’t work in our favour this time and I’m starting to think a fish finder may give us much better results when it comes to locating under water structures. As the day went on the sea completely flattened off and we couldn’t help but head back to the reef to have a few casts with the surface lures before the sun went down. It really did look magical and with the now gentle offshore breeze drifting us out it allowed us to cover a good bit of ground and at a steady pace. My boat is really stable and we could both stand up and fish back to back covering plenty of ground with our casts. It almost seemed to good to be true. Even if there wasn’t any fish this was just perfect, it all felt so right and any minute now you just expected your lure to be smashed in the air as a bass came up from the deep. Tim had a good couple of attacks from some nice looking Pollock in the 2.5-3.5lb bracket to his Sammy while I couldn’t muster anything. Then it happened, Tim called as he had a hit. I turned and got to see as a fish went mental for the Sammy. He kept working it and the fish kept coming before it came behind it like a pike creating a bow wave and engulfed the lure. Tim said it was a good fish but we could see that from the take. Pollock or Bass? From what I saw I was sure it would be silver. It held deep and below the boat we could see a cracking Bass doing it’s best to escape. The boat got pulled around as the fish tried to escape back down the the kelp. All the time we just watched through the crystal clear water and our Polaroids. It really was a magical moment and a great way to end our day. The fish measured 67cm and was a fine looking fish. Watching her bolt back into the kelp was pretty awesome too just a shame the gopro battery had died at this point! We tried for a while more and replicated the drift a few times but couldn’t find a fish. I changed to the Patch which has a slight rattle and managed a few hits from Pollock. We wondered if it was the rattle in the Sammy that was making the difference. We will have to see in the future if this is the case and surface fishing from the boat is starting to get me very excited. There’s quite a few of this style reef I know of now so I can’t wait to fish them especially as the season goes on. This entry was posted in The Fishing, Uncategorized and tagged Bass, Fiiish Minnow, Lucky craft Sammy, Lure fishing, Pollock, SIB, Wrasse. Bookmark the permalink. ← Heaven and Hell, underlying reel problems.